On Monday, the FNB Ikey Tigers travel to Pretoria to take on an FNB Tuks side who have been enjoying a rich vein of form as of late, easily dispatching both FNB CUT and FNB Shimlas in their last two matches. 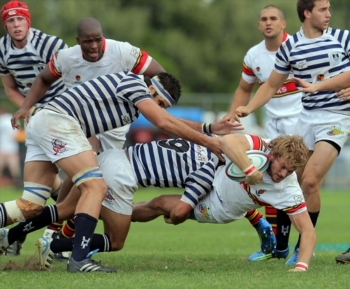 Many will remember the 100-25 loss that the FNB Ikey Tigers suffered at the hands of FNB Tuks last year at Cape Town Stadium, but the Ikeys will be determined to get one up on the team from Pretoria this time around and are aware that this could be their toughest challenge so far this season. “Tuks have their tails up after two massive wins, so we know we’ve got a big challenge ahead of us in Pretoria,” said coach Esterhuizen. In terms of making the semi-finals, all the FNB Ikey Tigers can do is make sure that they win their two remaining fixtures against FNB Tuks and FNB Wits. The rest, unfortunately, is out of their hands, as they would need the other results to go their way. “We’ve been trying to keep the vibe positive, because know that by some kind of miracle, we can get into the semi-finals. So we’re just focusing on the small chance that we do have for now,” said Esterhuizen. A win against FNB Tuks could offer a timely boost for the boys in stripes, after three successive losses against FNB Pukke, FNB Maties and most recently, FNB UJ. The team will be boosted by the return of Nyasha Tarusenga and Lohan Lubbe, who is expected to play again for the first time since being forced off with an arm injury against FNB Maties. 1 Wayrin Losper, 2 Cuan Hablutzel, 3 Michael Kumbirai, 4 Duncan Saffy, 5 Gary Porter, 6 Jason Klaasen (C), 7 Nama Xaba, 8 Nyasha Tarusenga, 9 Stefano de Gouveia, 10 Rob Anderson, 11 Seb Roodt, 12 Rico Lategan, 13 Joel Smith, 14 Rayno Mapoe, 15 Lohan Lubbe. 16 Martin Chandler, 17 William Day, 18 Lee-Marvin Mazebuko, 19 Alva Sendryani, 20 Sanele Malwane, 21 Msizi Zondi 22 Michael Henning, 23 Gerard Pieterse. The game is set to kick off at 19:00 on Monday, the 20th of March at Tuks Rugby Stadium (TV).